GUELPH — Guelph will be among the Ontario sites of demonstrations planned for Tuesday to protest Canada’s current immigration detention policies. Guelph-based migrant rights group Fuerza/Puwersa, meaning strength in Spanish and Tagalog, and similar groups have formed a coalition of immigrant justice associations. They’ve vowing to participate in coinciding protests Tuesday from 10:30 a.m. to 11:30 a.m. in Guelph, Toronto, Kitchener, Sudbury, Kingston, London and Peterborough. Fuerza/Puwersa will be chanting and marching with a banner from city hall to MP Frank Valeriote’s office, where members will hand in a petition of 1,000 names calling for an end to indefinite immigration holding. Immigrants deemed a flight risk while awaiting deportation are incarcerated by the Canada Border Service Agency. Toronto-based immigration consultant Mac Scott said in Canada, some current detainees have been jailed for more than five years while awaiting travel documents from countries of origin to be sent so that deportation can proceed. Scott said in many cases, the native countries of these detainees don’t want to take them back and travel documents are not sent, so they remain incarcerated. He said the United Nations does not sanction indefinite immigration holding periods and the U.S. has a policy that immigration holds can only occur for 90 days before an individual case is solved. To draw attention to this and other issues, immigration inmates at the Central East Correctional Centre, in Lindsay, Ont., have engaged in a series of hunger strikes since mid-September. These inmates have complained about being isolated from families, constant lockdowns due to short staff and allegedly inadequate access to medical care and social workers, among other issues. Anna Pape, spokesperson with the Canada Border Service Agency, said in an email the agency is reviewing the demands of the prisoners but Canadian safety is the priority. Joshua Gilbert, a member of Fuerza/Puwersa, said the group went to the Guelph Air Park with a banner and petition to protest on Sept. 30. Finding a lack of Canada Border Services Agency representation, the group went to the Kitchener-Waterloo International Airport instead to pressure the agency into accepting the demands of the inmates. Now, the group will look to Valeriote to assist them in taking the issue to the federal government. Valeriote said he’s aware of the hunger striking at the Lindsay facility and will meet with Fuerza/Puwersa members. Valeriote says he is investigating the conditions of the Lindsay detention centre and the Canada Border Service Agency must assure regulations are met. This international event is held every year in support of prisoners, and against the prison system that confines them. 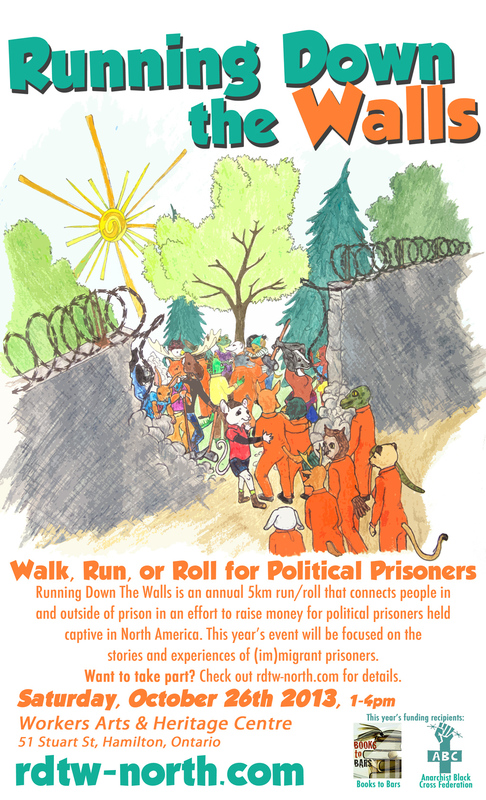 This year’s event is in support of North American political prisoners and (im)migrant prisoners across Ontario. The October 26th event will center the voices (im)migrants with experiences of incarceration in Canada.